Listen to conference call with GM executives and media about the shutdown of Saab at: www.autonews.com/gmsaabcall. DETROIT -- Saab and its 218 U.S. franchises will close down, parent General Motors Co. said today, marking the third sale of a GM brand to be canceled this year. This time, issues that came up in the Swedish brand's sale to Dutch niche automaker Spyker Cars NV couldn't be resolved quickly enough. The collapse of the deal with Spyker is the second failed effort to sell the Swedish brand in a month, after GM had sought a buyer for a year. In November, Swedish supercar maker Koenigsegg Group AB terminated its agreement to buy Saab. GM said a week later that if it couldn't find a buyer by year end, Saab would wind down. Spyker, which hadn't been an original bidder for Saab, was the only option, Smith said. So the companies began working through due diligence from scratch. “It shouldn't surprise anybody that in a short period of time, with that sort of background, that issues would arise that couldn't be resolved,” Smith said. Smith also headed GM's negotiations to sell its European Opel brand to a consortium led by Canadian supplier Magna International Inc., but GM decided last month to keep the brand and canceled the sale. The automaker's sale of its Saturn brand to Penske Automotive Group Inc. failed in September when France's Renault SA backed out of its agreement to provide Saturn with future product. “This is a year that we choose not to repeat -- I would just say that,” Smith said. GM still has an agreement to sell Hummer to China's Sichuan Tengzhong Heavy Industrial Machinery Co. Ltd. GM also is winding down Pontiac, leaving the automaker with four U.S. brands: Chevrolet, Cadillac, GMC and Buick. Both GM and Spyker decided to cancel the sale at meetings this morning in Stockholm, Smith said. He declined to name the issues that arose. Saab will now wind down, leaving 3,400 employees and 1,100 dealers worldwide to find other options. About another 3,000 people are employed in ancillary industries. “We expect Saab to satisfy debts, including supplier payments, and to wind down production and the distribution channel in an orderly manner while looking after our customers,” said Nick Reilly, president of GM Europe, in a statement. Dealers at Saab's 218 U.S. outlets signed agreements earlier this year that detailed the wind-down plan if a sale fell through and no other buyer was available. Dealers received some compensation at that time, GM spokesman John McDonald said, although he declined to give more details. Saab stores will continue to service Saab customers while they're operating, McDonald said. As dealers wind down their franchises, GM will contact each store's customers and direct them to another GM outlet for service. Parts, expertise and tools will shift to the store that's picking up the Saab customers. It's possible, McDonald said, that Saab dealers that have other GM franchises will be chosen to continue servicing their customers at their continuing outlets. That's what happened with many Saturn stores, he said. GM's peak for Saab was 47,914 in 2003. The company's U.S. high was 48,181 in 1986. 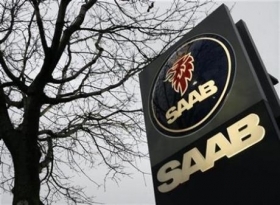 China's Beijing Automotive Industry Holdings Co. said this week it had agreed to buy some assets from Saab, including the intellectual property for the 9-5 and 9-3 sedans, as part of a push to develop its own-brand cars. GM's Smith said it's possible that another company might come forward during Saab's wind-down period and express interest in buying certain vehicles or technology, as BAIC did, or even in purchasing the rights to Saab's brand name.